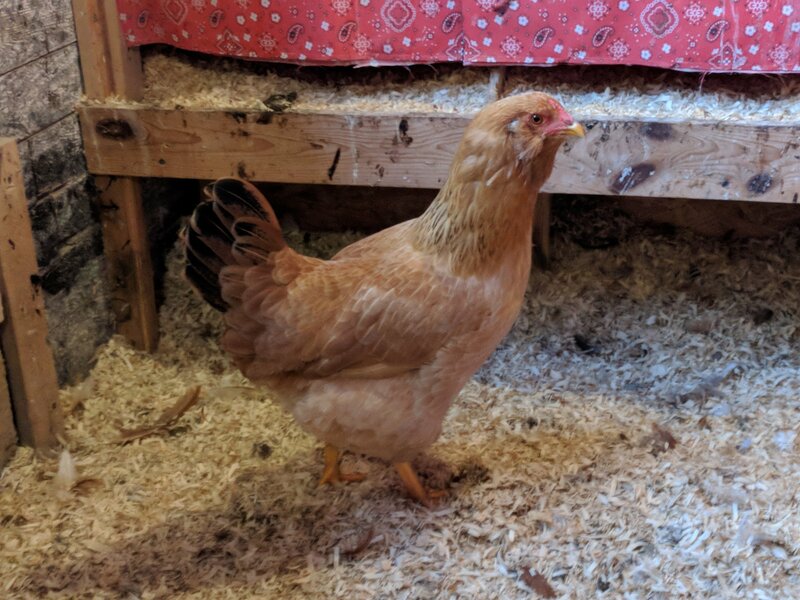 If you’ve been following my blog, you’ll know that one of my hens – a spirited and friendly little girl named Maicey – was injured, presumably by a rooster spur. We have roosters, two of which have spurs, so this is a good likelihood. Given that Maicey’s favorite rooster is our main rooster, Double Dots, I’m going to assume that it was him. 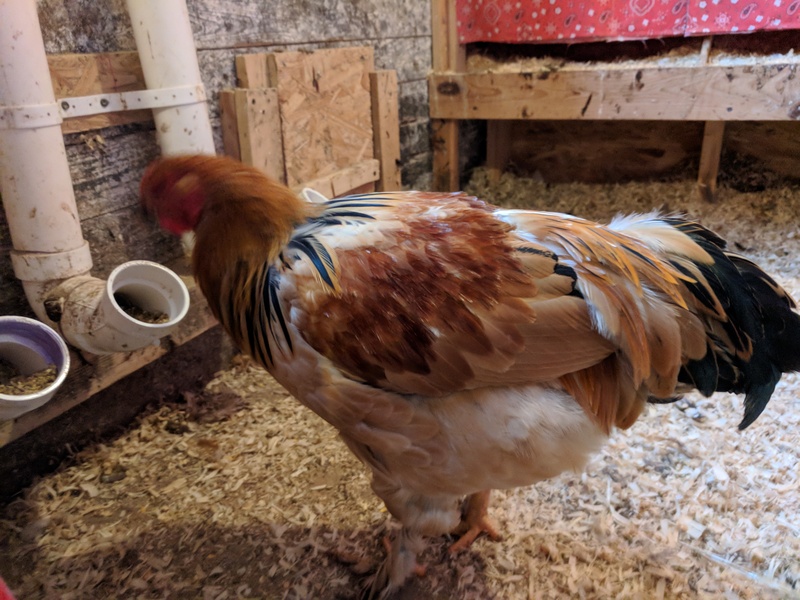 Dots is a 2 year old golden comet rooster, also known as a gold sexlink. He does have long spurs, but thankfully not overly long. 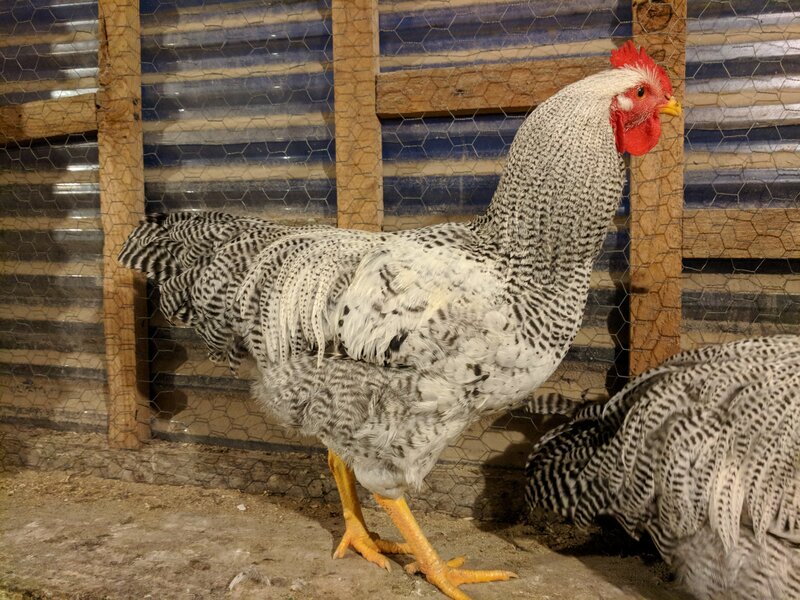 Over the last couple of days, in between treating Maicey’s wound and shuttling my son to baseball games, I have been researching the best methods of trimming or removing rooster spurs. 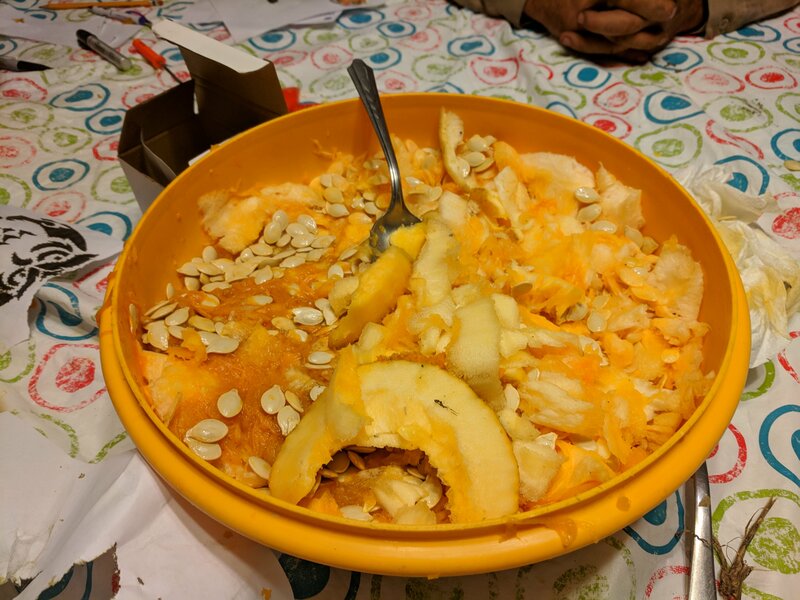 The first is the Baked Potato Method, in which you basically shove the spur into a hot baked potato and keep it there for two-or-so minutes. None of these are the method I used. Not because they aren’t all good, but because I knew it was just going to be me and my Girl doing the trimming. 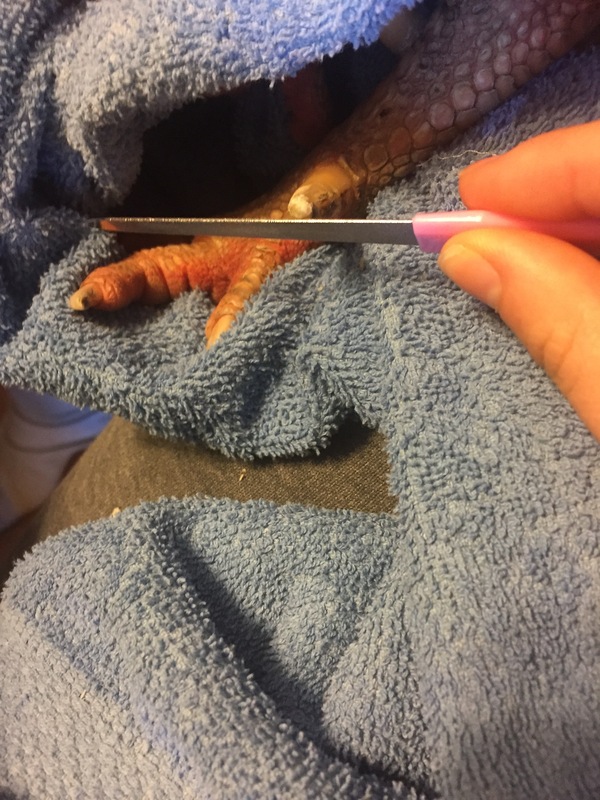 Instead of full removal (baked potato or pliers methods), we went with a simple trim, with dog nail clippers and a metal nail file, and followed the basic instructions, outlined here, by the Chicken Chick, to remove 1/4 – 1/3 of the nail. 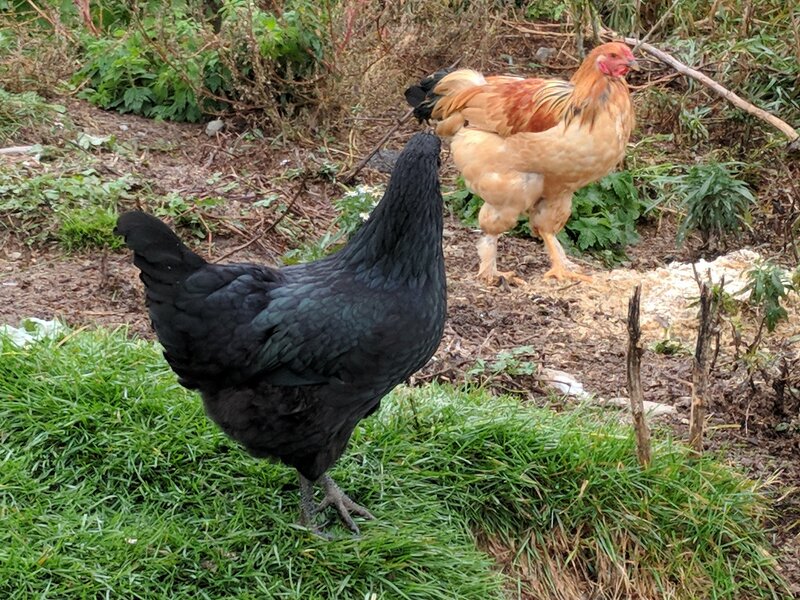 After you have decided on a method that works for you and assembled the tools you will need, you need to consider your rooster. You know him the best, after all. The videos above are all done in the day time, but a lot of people recommend going to get your rooster at night, in the dark after he has gone to roost. Why? Because he will be easier to catch and handle when he is sleeping. In the case of Double Dots, this is not so much of a consideration. He is quite possibly the gentlest rooster ever. I can walk out into the pasture, scoop him up in my arms and carry him around like a toddler. Pip and the other boys are a bit different, so I’ll have to figure out what works best with them. I started by plopping Dots in the sink and washing his feet and spurs. 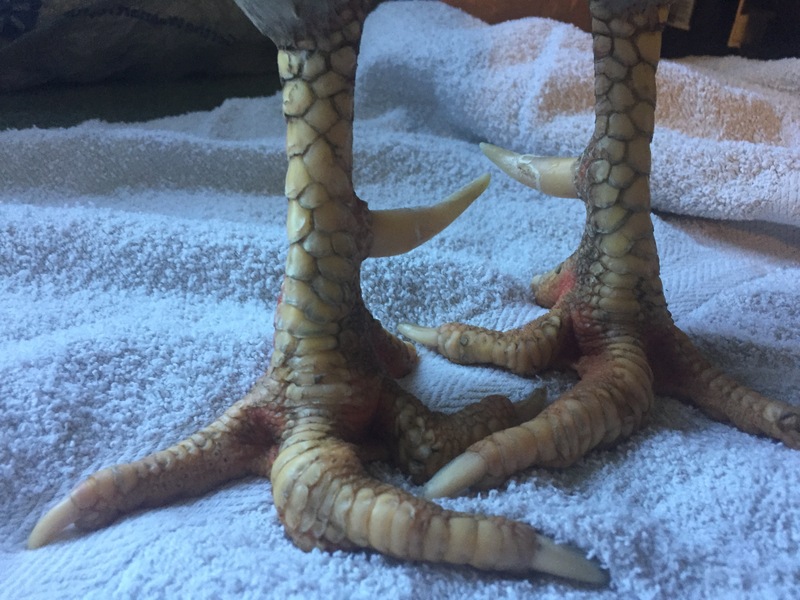 I also took the time to examine his feet for sores or anything else. You might as well, while you have access to clean chicken feet. As you can see, Dots just stood there like he was king of the world. He’s not even bothered that he’s not with his hens, or that he’s in the kitchen, or just had his feet washed. He’s not causing a fuss or anything. This one here – up front on the left – is the offending spur that hurt Maicey. 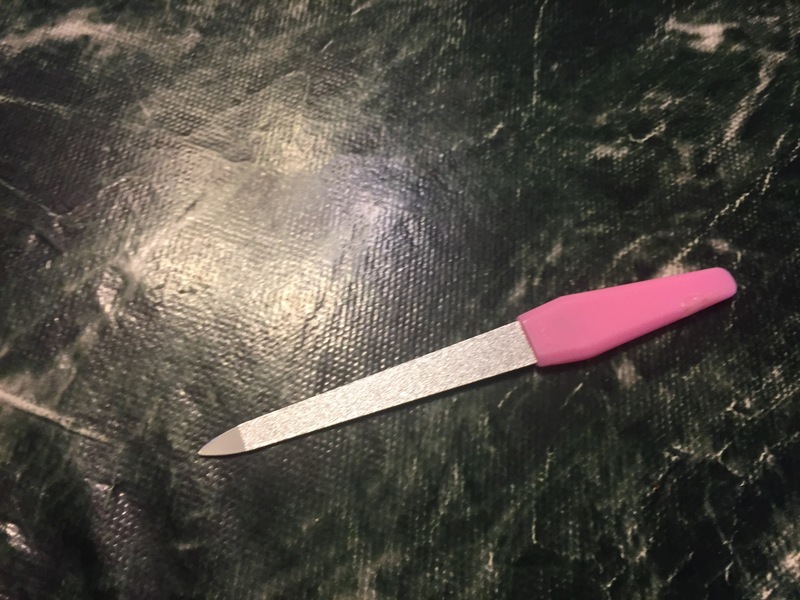 It’s sharper than the other one, for some reason. 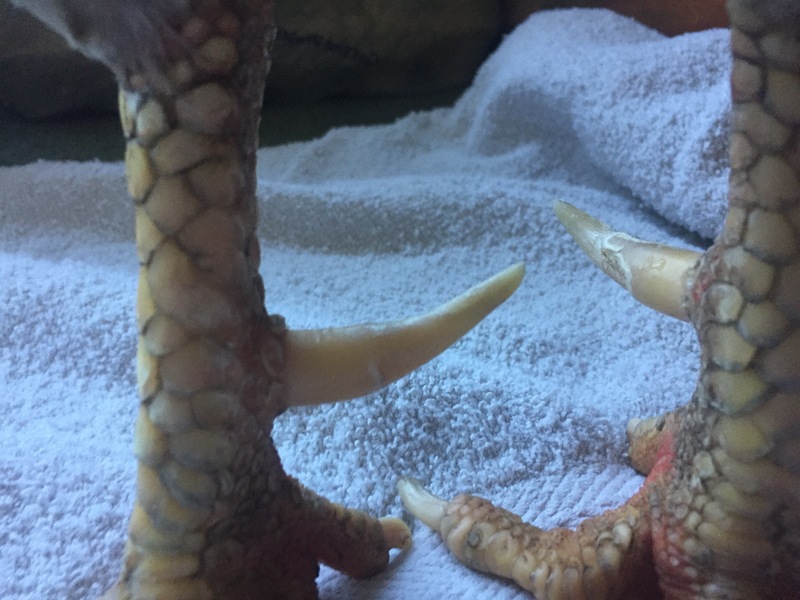 His spurs are not as big as some of the spur-removal videos out there, but the one is/was really sharp and pointy. I sat in a chair, wrapped Dots in a towel, and my Girl did the clipping. She did about 1/4 of each spur, and then used the file to blunt them so they weren’t as sharp. See how calm he was? Filing the spurs so they aren’t as sharp. My Girl wanted to paint his toe nails, too, because he was just so chill about the whole thing. I do not anticipate the same experience with Pip. He lets me pick him, but only if he’s on the window ledge or a roost. I can’t just walk up and tuck him under an arm like I can his papa. 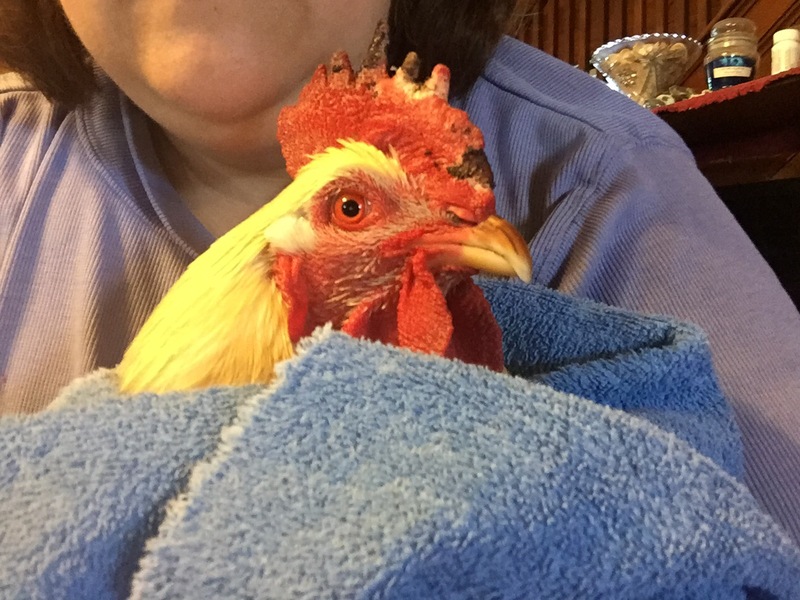 So again… please take your rooster’s individual behavior and personality into account when you prepare for this. You know him best. You may also want to have a styptic powder or corn starch on on hand. If you cut too far on the spur, you can cause them to bleed, kind of like a dog’s nail will if you cut past the quick. 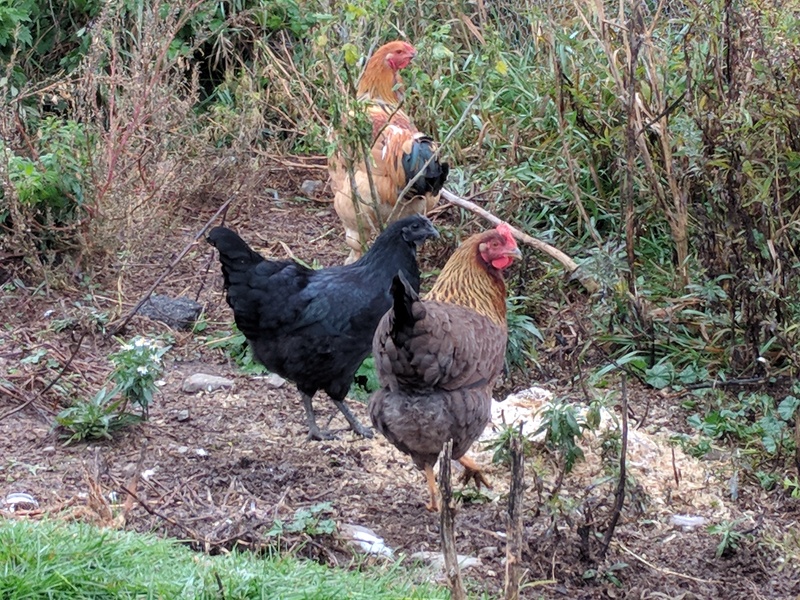 Okay, so… last week, my hens decided it would be fun to do their dirt bathing in the ashes left over from the burn pile. They came out of it covered in soot. 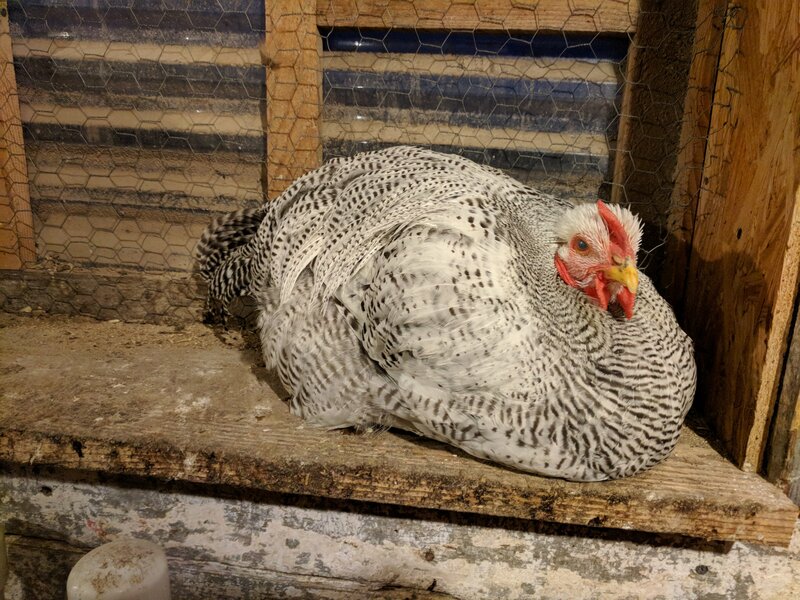 All the white hens were gray, all the Sexlinks and RiRs were various shades “muddy” or “moldy.” (I don’t know how to describe it. They look bad.) And even though it has rained the last few days, they still look filthy. If I didn’t have so many of them, I’d be tempted to give baths. But since the girls are unfit for pictures, we will have to make due with pictures of my boys. Currently, there are four of them. My handsome Double Dots, as you all know. He’s a golden sexlink, also called a Golden Comet. I’ve talked about him before. A lot. Dots is the father of Pip…. 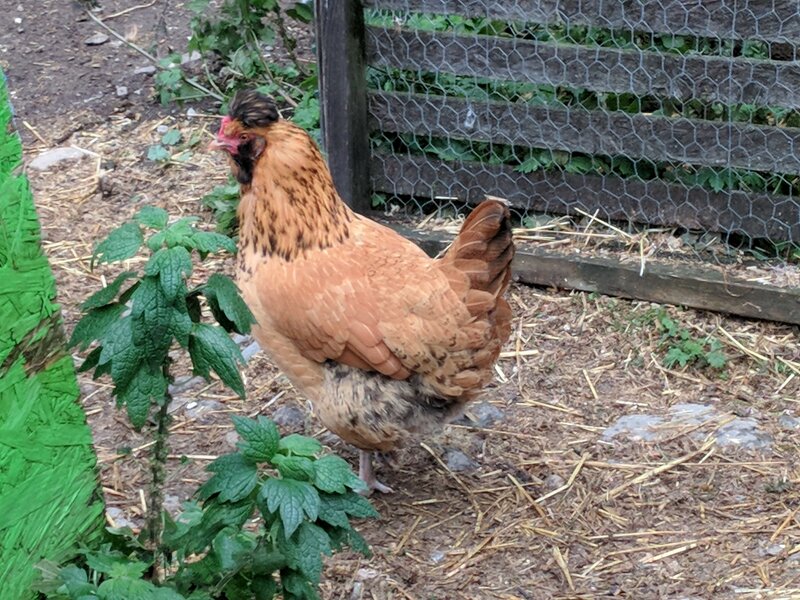 … who was our first-hatch chick, and the oldest of the “2nd generation” flock. They have an odd sort of relationship. Pip has a lot of respect for his papa, which is probably good because he grew up alone, with no same-aged hatch mates to back him up when he stepped out of line. 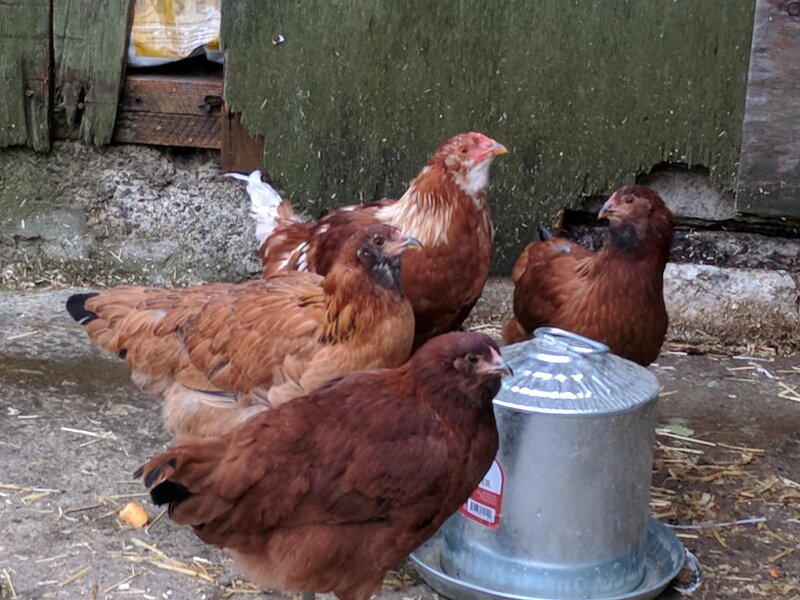 Dots and the Aunties (the others hens) put him in his place a lot from the age of 9-weeks to 1 year. Now the Aunties kind of like and he and Dots work together to protect the flock. They don’t fight, that I’ve seen anyway. Dots does chase Pip, if he catches him mating or whatever, but it’s usually only a few feet and then he stops. They tolerate each other on the roosts at night. And they BOTH take Felix to task. 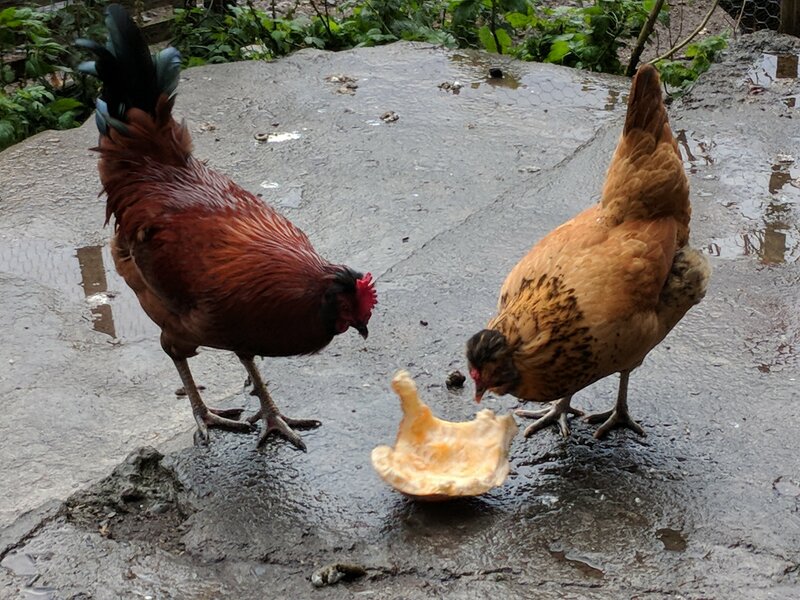 Felix (who used to be Felicia, but clearly is NOT a hen) is gen 3 for this rooster dynasty, as I believe he is Pip’s son, born of one of the Buff Orpingtons. I only guess Buff Orp for the mama because he really isn’t red like the RiR-cross chicks. Let’s look at Dani (the red rooster show here), in comparison. This is a younger picture, but he was a deep deep red by the time he went to freezer camp. Felix started out as a cinnamon colored chick, looked butter scotchy as a teen, and while his reds are coming out (Pip’s mother was RiR), he doesn’t have the same depth or shade of red as Dani. 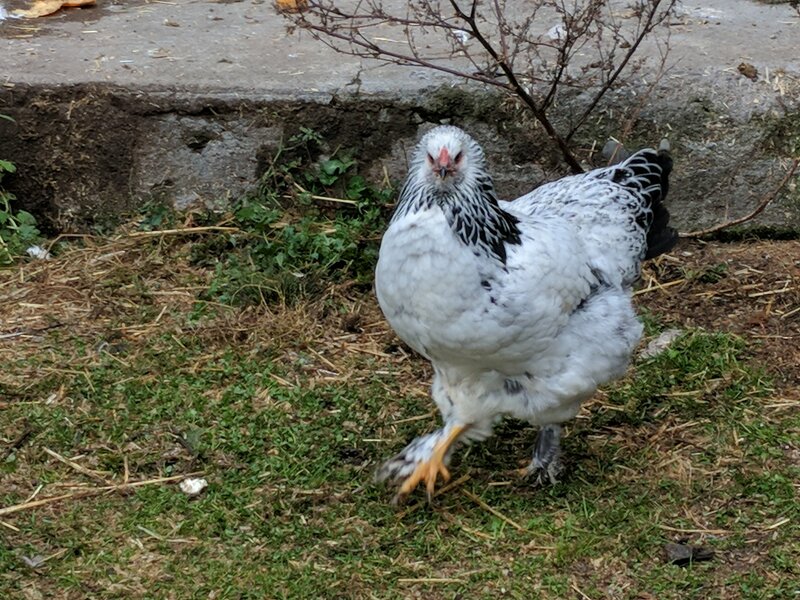 And since we’ve established that Pip+Australorp gives me the Dalmies (Pongo and Perdie),that really only leaves my two Buff Orpingtons as potential mommas. Felix has yet to find a place in the flock that suits him. Both Dots and Pip chase him if goes after the ladies and tries to mate. Part of that is because Dots naturally assumes all the ladies are his, and part because the ladies don’t want to mate with Felix. He chases, pulls neck feathers and is awkward. The girls run, squawk, and scream until Dots or Pip (or both) go after him. In other words, he’s where Pip was last summer. Poor boy. 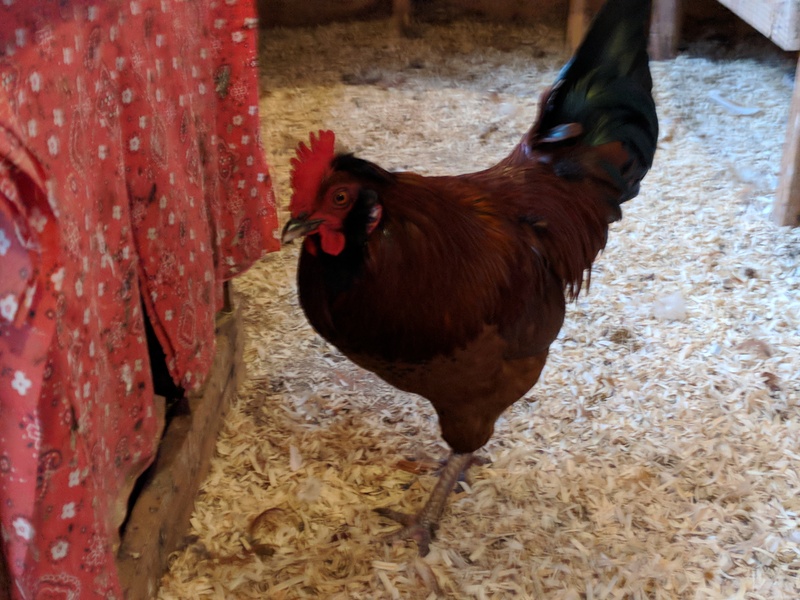 Some of the bolder hens peck at him, especially at bed time, and I have cleaned and fixed up minor comb injuries as the result of their pecking. 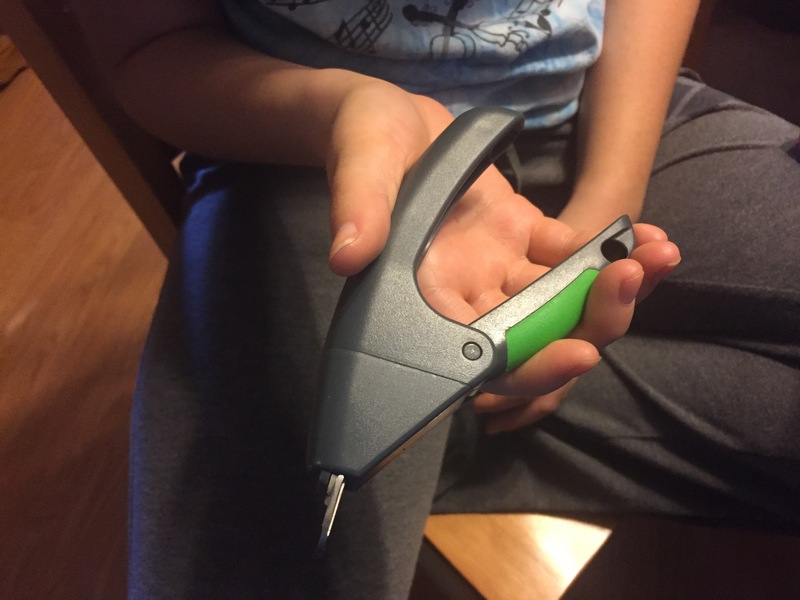 Sadly, he kind of brings it on himself and I don’t know what to tell the poor kid. Not that he’d 1) listen or 2) understand me, him being a chicken and all. So he’s just going to muddle his way through this on his own. At least until his fate is decided. A friend of mine named him Felicia, and I think she would prefer I keep him around so she can see him the next time she visits. I have talked to her about it and she has been trying to find a place for him somewhere near her (in Indiana)but let’s face it. 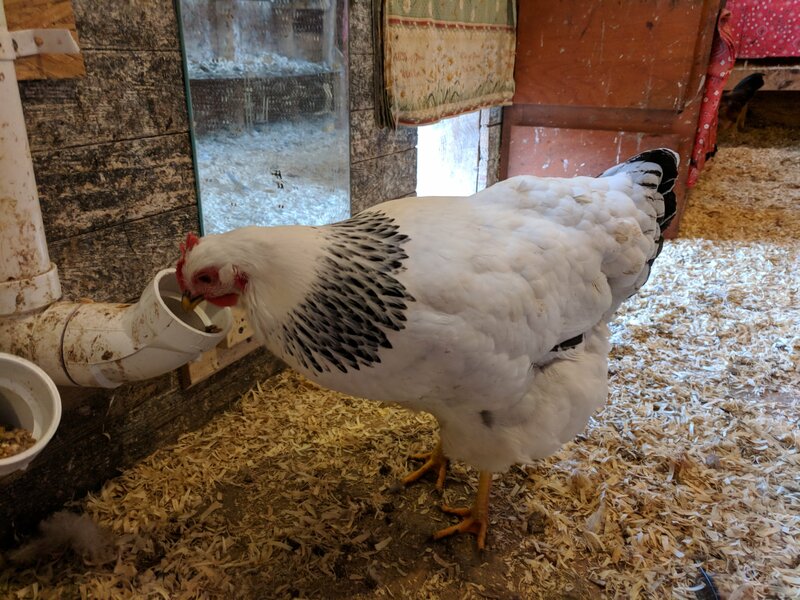 With the threat of avian flu, it’s not likely too many people will want a rooster from an unknown flock out of state. Even a mostly tame one. But there is this little (not so little) guy to consider. Luke, formerly Leia. Who started crowing not to long ago and hasn’t stopped since. I mentioned previously that Luke and his sister, Padme, where scared of going outside. Padme has gotten over it. 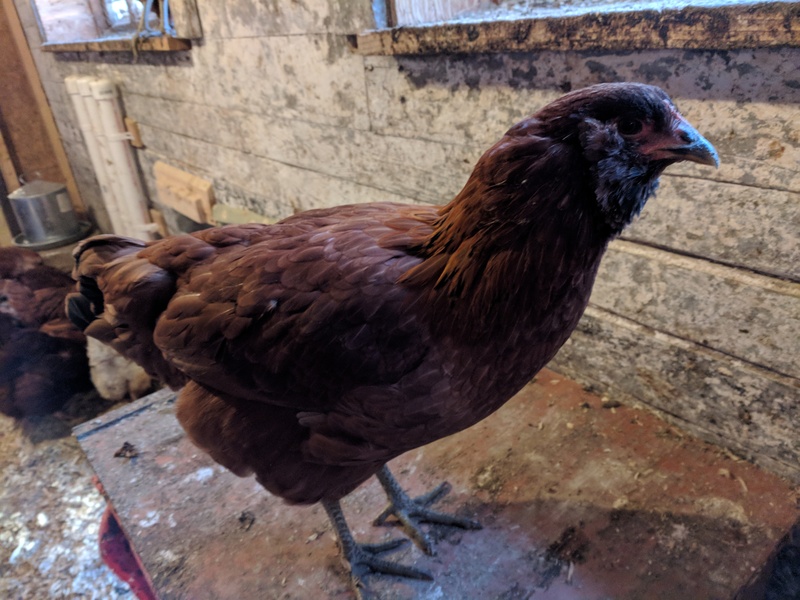 She is finally starting to realize that she is a hen and should be outside doing Hen Things. Luke? He’s not too sure about this concept of outside hen things. He will stay inside, sit on the roost and crow for her (or someone else) to join him. He has a loud, bold as brass little “Ooo-oo-Oooo!” (Because it’s not quite an Rrr-r-Rrr yet.) and sometime she does come back. Sometimes he gives up and goes outside to find her. What’s interesting to me is that Dots allows Luke to do his Ooo-oo-Ooo. Last spring when little Black Jack was learning to crow (at 9 weeks, not 20 like Luke), Dots assumed it was a threat to his dominance and went on the offensive. I had to rehome little Jack just to keep him safe and ensure a peaceful integration. But Luke,having been hatched by Abby, raised as a winter baby (like Pip), is not a stranger. He and Dots both crow for me every morning when I go to let them outside. He crows for me (or, for his sister, or for whomever…) when he is in the coop… and sometimes when he is outside. He crows more than Pip does. And definitely more than Felix does. 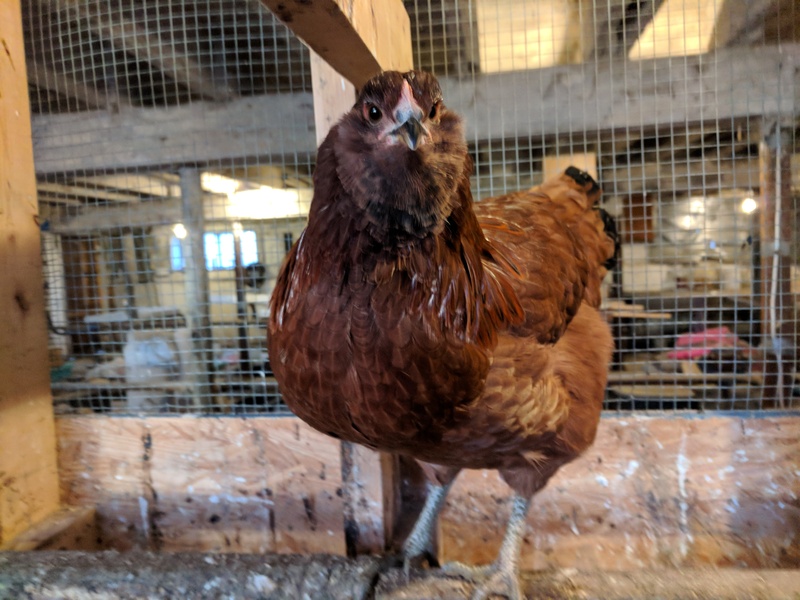 I wonder if my scaredy little EE isn’t going to turn out to be more dominant of the 3 younger roosters? Or if Dots just hasn’t noticed because he has been more focused on keeping Felix and Pip in their places? This past Fall, we sent Dani, plus Abby’s four young rooster (my Boys of Summer) to the Freezer Camp. I kept for a long while, hoping that someone would buy or otherwise take the Sumtaler’s off my hands. But in the meantime, Dots and Pip got very spoiled by having a lot of ‘extra eyes’ watching over the girls. 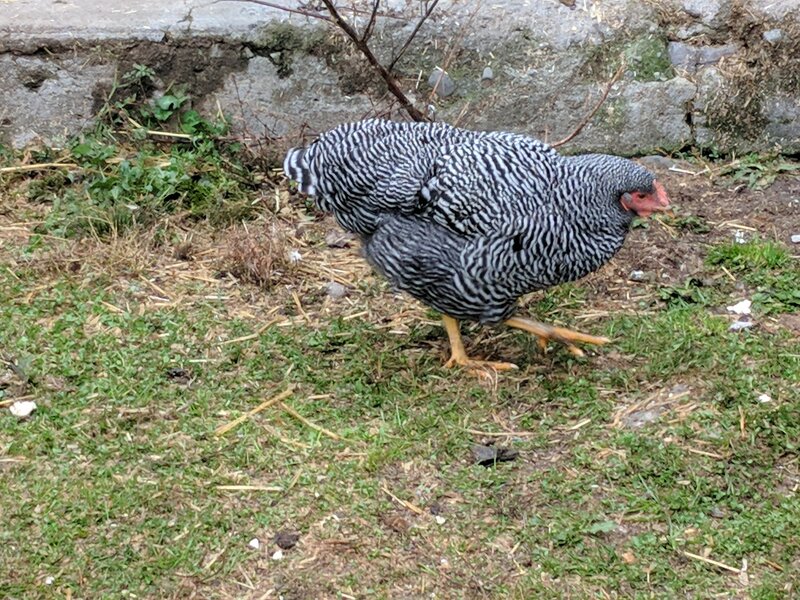 There were roosters with hens everywhere. So Dots could spend time with his favorite ladies and forget that he ‘had to chase Pip’ and yet, there was back up in case of unforeseen danger. 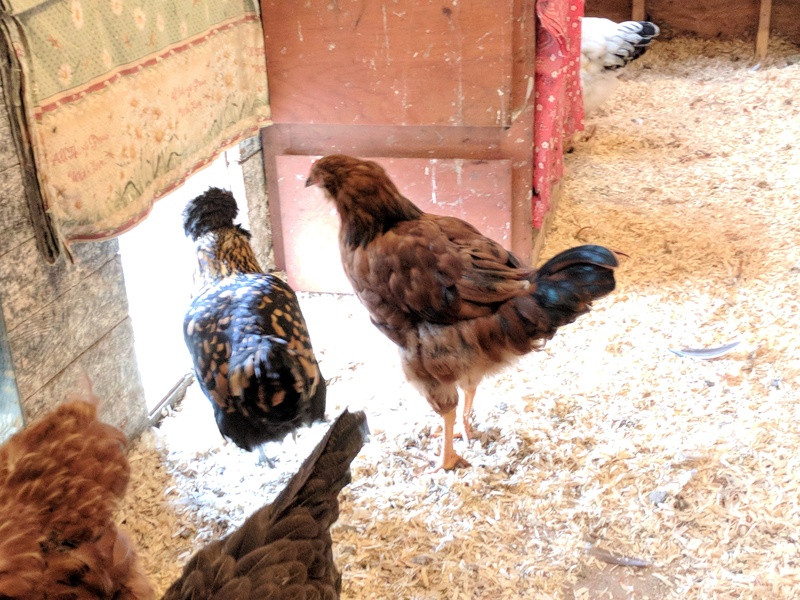 I have noticed since their departure from the flock, that Dots and Pip seemed to have their “hands” full with the ladies. 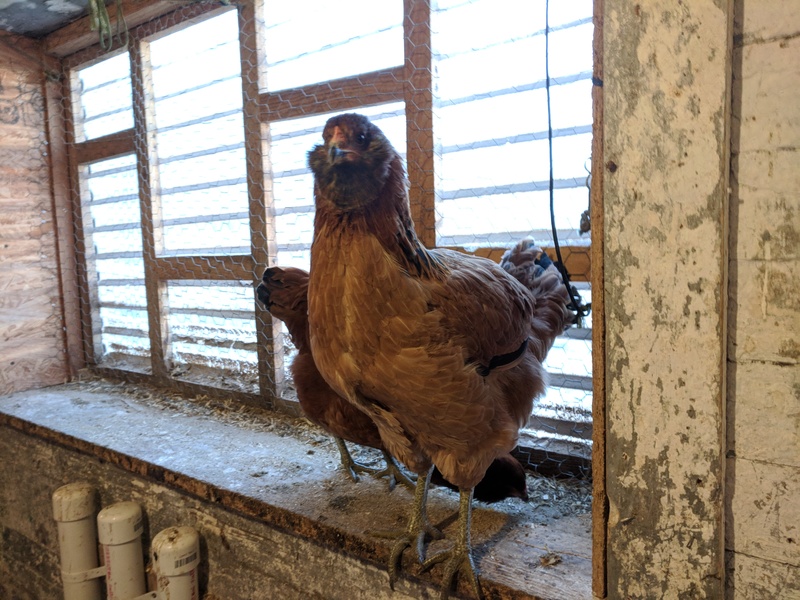 Both of them in the coop while most the hens were outside. Who’s looking after the ladies? So I think that one or two more roosters won’t hurt, provided they all get along and don’t hurt the hens. Currently, Felix spends a lot of time outside with the hens. He is trying to impress them. A couple of them will squat for him to mate with now. Most of them still find him annoying. But again, they thought the same things about Pip last year. So we’re going to try it. See how things go, and decide from there if the dynamics need to change or the flock needs thinning.